What do you do on your public holidays? Go to the beach…have a picnic…go out with friends? Yeh…sounds like fun…but not as much fun as closing all the blinds, putting the air conditioning on and trying to ignore the searing heat of an Australian summer. Oh, and I made donuts. Yippee!!!!!!!! I got the recipe from Tastespotting , but it originates at the Food Network and is an Alton Brown Donut Recipe . I tried making the donuts straight from the first rise of the dough, and then from the second, and recommended rise. The first lot was lovely when eaten straight from the fryer but went a bit tough as they cooled. The second lot puffed up and were a lot lighter and stayed that way even when cool. 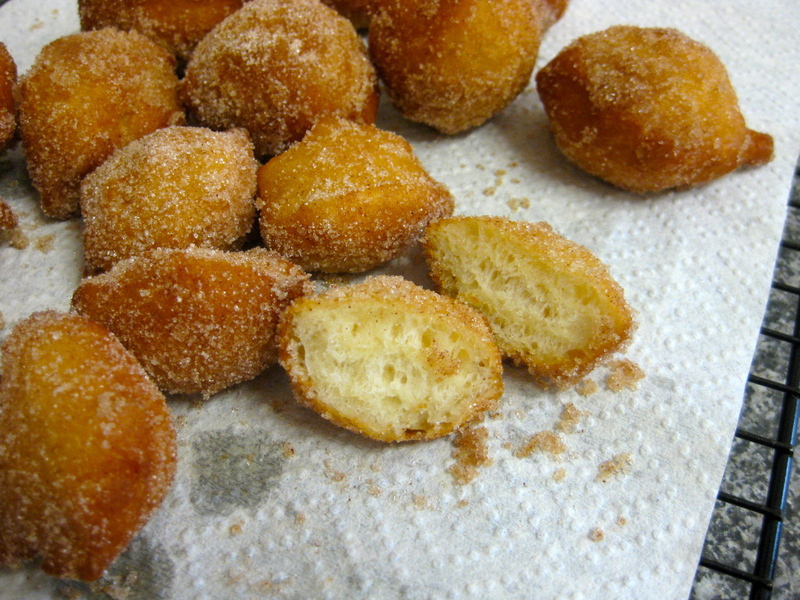 I only made donut-balls or holes, I didn’t go to the trouble of putting holes in my donuts. I have never made donuts before but I would absolutely recommend this recipe and this cooking experience.